Need to determine the value of an Orange Drop cap? 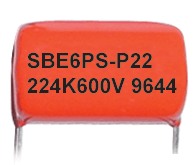 Use the code on the capacitor (below the manufacturer's part number) to determine its value, or you can calculate the value below. K = tolerance, F = ±1%, J = ±5%, K = ±10%, etc. Please enter the code found on your capacitor in the forms below.